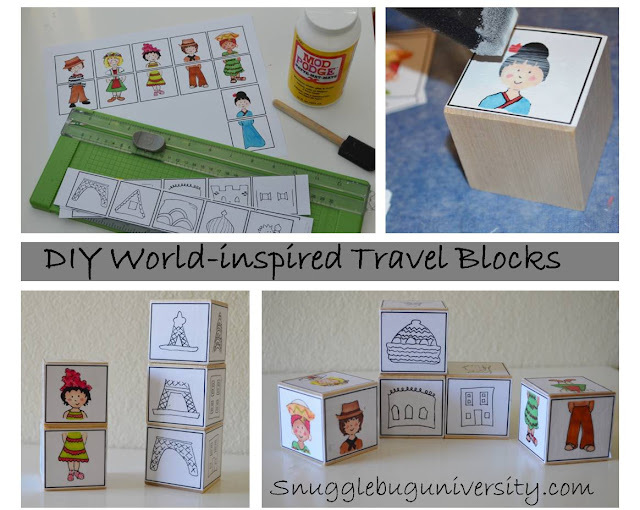 After making these travel blocks, I thought it might be fun to have an illustrated version with kids from around the world. They also went perfectly with my youngest daughter's internationally inspired nursery. These blocks are super easy to make. Ready to get started? Keep reading to see how easy it is to make your own world blocks. You and your kids will be loving all of the different combinations you can make. the printable, printed out on normal printer paper. You can purchase it in my Crafty shop, or my Etsy shop. Now let's get started. Cut out each of the individual blocks. Make sure your kids and blocks are clean and dry. Then apply some Modge Podge to the block. Add another thin coat of Modge Podge over the illustrated image to protect it. After it dries, you will want to add another thin coat. Repeat with all the other sides of the blocks. Remember that you'll want to do only 4 sides at one time, so that you will have two sides of the block to hold onto as you apply the Mod Podge. That's it! Pretty simple, huh? Here they are ready for hours and hours of entertainment! Please remember that this printable is intended for YOUR personal use. If you have any questions, please ASK. Jill, I will have to check out your Etsy store for some baby gifts soon. I love these blocks, too.